A $20,000 reward is being offered for information leading to the capture of person or persons responsible for fatally shooting three sea otters off the Central Coast. In mid-August, the bodies of two juvenile males and one adult male otter washed up on the shoreline between Santa Cruz and Aptos. Tests show the otters were shot between late July and early August. Last week, the nonprofit Center for Biological Diversity announced it would contribute 10,000 to the reward. Earlier in the week, the California Department of Fish and Wildlife, the Monterey Bay Aquarium and a private donor offered a $10,000 reward for information leading to the shooter’s arrest. 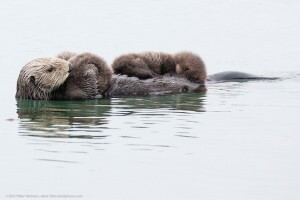 Southern sea otters are protected under the Endangered Species Act and state law. Killing an otter can result in jail time and up to a $100,000 fine. Not to say this was OK, but $20,000 reward for information? Sociopathy. A certain number of individuals that walk this earth—do not have respect for life, and for innocence. Sadly, a number far more than we want to admit. What Sick individual would shoot a Sea Otter? I hope they are found and brought to Justice! probably the same one that doesn’t like Flopsy, Mopsy and Peter for trashing up a garden.